The Revolution of the McWord; or, why difference and complexity is necessary. “It’s a beautiful thing, the destruction of words.”—George Orwell, 1984. A little harsh perhaps, especially considering I was a four-year old three-foot high mini-human, but still, I haven’t forgotten it, and now I’m fluent in French. My effort at breaking down a language barrier caused someone to snap and (it seems) be insulted by my tiny human attempt at French. So certainly I agree with Jennifer’s point from her recent blog article here that “Building intimacy (for this is what I take the phrase “brings you closer” to mean) is not about having a rough idea of what someone is saying, it is about understanding the nuance of every gesture, every reference and resonance.” This is part of the (many) reason(s) why people on the autism spectrum, for example, find social interaction so difficult, because of a difficulty understanding these very gestural nuances that are so central to human communications. And this lack of understanding often brings with it frustration, isolation, loneliness, and pain. The point is: it’s not just about the words; it’s about how they are said, the tone, the gesture, the contexts. These are things a translation program cannot understand or impart, and it is arrogant to suggest that such facets of communication are by-passable or expendable when so many people struggle with them on a day-to-day basis. Moreover, they are facets of human communication that cannot be erased or eliminated from speech-exchanges with a view to making these exchanges “simpler” or “doubleplusgood.” That brings us right into 1984 territory. So, language, or rather languages (Jolas was fluent in several and often wrote in an amalgamation that, he felt, better reflected his hybridic Franco-German (Alsatian) and American identity), was not complex enough to fully express the totality of reality. Mark Zuckerburg proposes something of a devolution, a de-creation, a simplifying of difference, a reintegration and amalgamation of the facets that distinguish us from others. But while it might appear useful (Esperanto, anyone? ), is the experience going to lead to richer conversations? To a demolition of barriers? 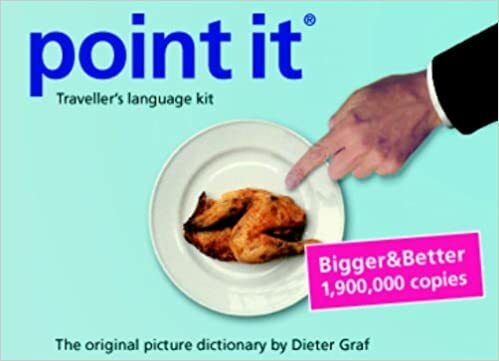 Or will it result in something akin to Point It, the highly successful so-called “Travellers Language Kit” that contains no language at all, but rather an assortment of pictures that allow one to leaf through the book and point at the item you want. After my childhood French toilet incident, I myself could never overcome the mortification involved in using Point It. But even if I did, would the success of an exchange wherein “Me *points at* Coca-Cola” results in my being handed a Coca-Cola give me the same satisfaction as my first successful exchange with someone in another language did? The first time I managed to say something in French to a French person in France and be met with a response in French as opposed to a confused look or (worse) a response in English. Would Zuckerberg’s own much-lauded trip to China in 2014 where he was interviewed and responded in Mandarin have received as much positive press if he had worked through an interpreter, or used a pioneering neural network translation platform? I don’t think so. Reducing or eliminating language difference also creates hierarchies, and this is dangerous. What language will we agree to communicate in? Why one language and not another? What facets of my individuality are accented in my native language that are perhaps left out or lost in another? We have to resist what Presner calls “the impulse to quantify, modularize, distantiate, technify, and bureaucratize the subjective individuality of human experience,” even if this impulse is driven by a desire to facilitate communications across perceived borders. Finding, maintaining, and celebrating the individual in an era that is putting increasing pressure to separate the “in-” from the “-dividual” for the sake of facility will lead (and has perhaps already lead, if we can refer back to Don DeLillo’s 1985 observation that “You are the sum total of your data.”) to the era of the “dividua”; where instead of championing individuality, people are reduced to their component data sets, or rather the facets of their personhood that can be assigned to data sets, with the rest—the enigmatic “in-” that makes up an individual—deemed unnecessary, a “barrier” to facile communications. Rather that working to fractalise language, as Eugene Jolas did, universal translation (which is itself a misnomer, all translations are, to a degree, inexact and entail a degree of intuition or creativity to render one word in or through another word) simplifies that which cannot, and should not, be simplified. This would be doubleplusungood. 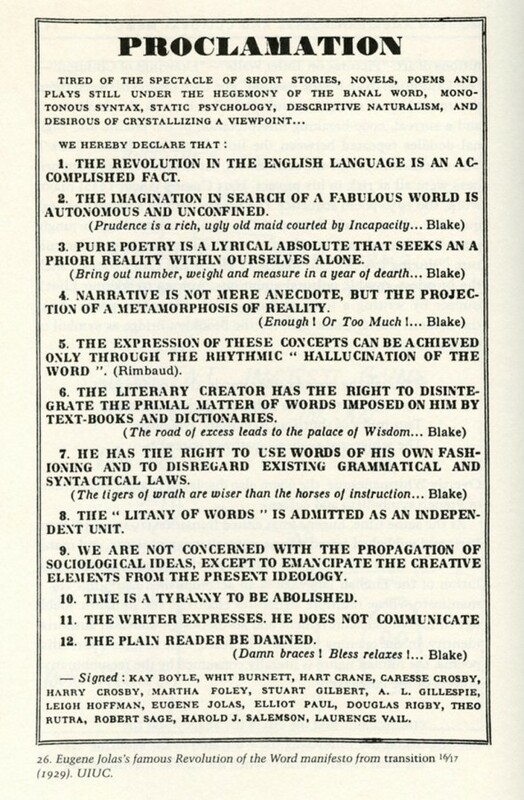 Eugene Jolas, “Revolution of the Word,” transition 16/17, 1929. Born in the New Jersey, Jolas moved to Europe the bilingual Alsace-Lorraine region as a young child, and later spent key formative years in the United States. Presner, in “The Ethics of the Algorithm: Close and Distant Listening to the Shoah Foundation Visual History Archive” in Fogu, Claudio, Kansteiner, Wulf, and Presner, Todd, Probing the Ethics of Holocaust Culture.. Previous postA recipe for intimacy?